It’s possible that there is no more excluded and marginalised group worldwide than people with learning disabilities. There are certainly much more harshly and deliberately victimised groups in many places – but for a single group, neglected to the point of rights abuse on a global basis…? It’s probably not useful to speculate about this anyway, and certainly not to set up any group against any other (and in no way is this speculation intended to downplay other global dimensions of exclusion such as gender and caste). Whether the exclusion of people with learning disabilities globally has anything like the level of public awareness, attention, or outrage, that it should. Needless to say, if you buy the premise at all, then these two points have a common causality: the simple lack of importance given to the lives of people with learning disabilities. This blog, if it’s about anything, is about the way that the marginalisation of some groups at least is exacerbated by being uncounted. Uncounted, so denied a full role in the statistics upon which policy decisions are made; and in the data which forms the base for political accountability. Consider one of the world’s richest countries, and one with a long and proud history of universal (universal) health provision: the UK. On average, men with a learning disability died 13 years earlier and women with a learning disability died 20 years earlier than the general population. 37% of deaths would have been potentially avoidable if good quality healthcare had been provided. Periodically, the exposure of a particularly terrible case of abuse results in commitments to progress. The major recent example is the BBC’s exposure in 2011 of systematic abuse at the Winterbourne View hospital. Aside from specific legal consequences, this triggered the ‘Concordat’ – “a programme of action to transform services for people with learning disabilities or autism and mental health conditions or behaviours described as challenging”, signed up to by everyone from the Department of Health and Local Government Organisation, to the Care Quality Commission watchdog and major NGOs in the sector such as Mencap and the Challenging Behaviour Foundation. A particular aim was to move everyone who could live in the community – expected to be the vast majority – out of such institutions, with widespread closures expected. Within getting into details, these commitments were both welcome in themselves, and indicative of the failure to count to that point. More than two years since the Concordat – and getting on for four years since the motivating scandal broke – what progress has been made? a rapid reduction in hospital placements for this group of people by 1 June 2014. People should not live in hospital for long periods of time. Hospitals are not homes. As the report notes, in 2012 data was a fundamental barrier to progress. Despite some important advances, the findings on the present position are damning. NHS England lacks adequate and reliable data to monitor progress. In 70% of the 281 case files we reviewed at visits to 4 hospitals, there was at least one error in the June 2014 quarterly census data submitted to NHS England. Official data for our cohort of 281 patients showed an average stay of 3 years and 10 months. The actual length of stay was 4 years and 3 months in their current hospital. Available statistics are not accurate either about the numbers of people in institutions, nor about even the most basic features of their experience. It’s difficult not to think that we (still) don’t bother counting, because we (still) don’t care enough to do it right. 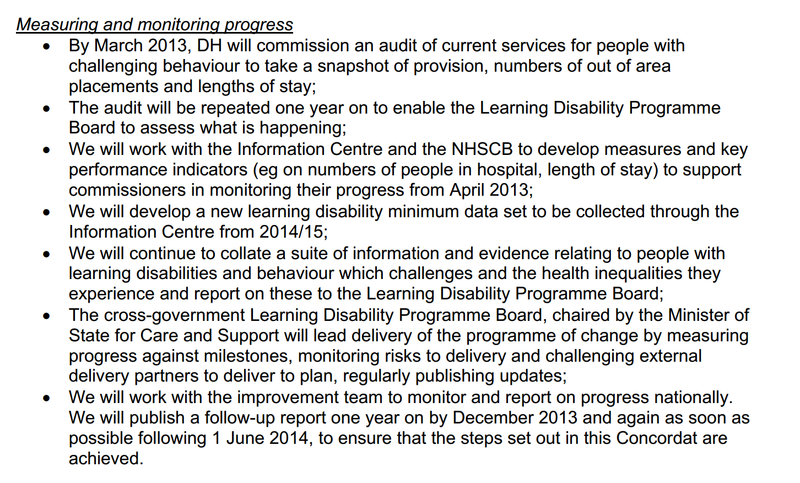 Justice for LB responded to the NAO audit of the Winterbourne Concordat with their own self-audit, which is (surprisingly!) a thing of beauty, anger and hope. The potential for the ‘LB Bill’ to make it into parliament after the general election is real, and exciting. Perhaps the best way to stop being uncounted is to demand it yourself – but of course if it were that easy, nobody who wanted to be included would be left out in the first place. Uncounted is a political phenomenon, and Justice for LB is a most welcome, and deeply political response. How cautious should advocacy organisations be about legal risks? And how much important work goes undone, or the results unreported, because the threat of legal action could be existential for the organisation? Earlier at the (virtual) office we were discussing the importance of considering legal risks in relation to some specific pieces of work, and to some upcoming possibilities. Without getting into the detail, all have the potential to involve individuals, multinationals or major accounting firms that might be quite happy to sue over perceived reputational damage. One solution, of sorts, is to be right: don’t make mistakes, and you ought to be covered. The Defamation Act identifies a range of defences, including truth but also ‘honest opinion’ (even if untrue), and ‘public interest’. On balance, at least for me as a non-lawyer, it’s still easy to feel that there’s enough room for you to end up in court for saying reasonable things, with reasonable evidence. any number of pieces of work that were abandoned in the planning stage – so the questions were never asked – because of likely risks of trying to publish any answer obtained. So, I complained to twitter…. Depressing work conversation around the #taxjustice research we can’t/won’t do due to costs of libel lawyering/risks of being sued anyway. …and the twitterbrain provided a selection of answers. Get sued, but have (really, really) wealthy backers. Get sued, but crowdfund a defence fund. Get sued, but have pro bono lawyers on hand. Get sued, but set up some kind of offshore structure to undertake/publish the research so it doesn’t threaten the main organisation. I don’t much like any of the ones that start with ‘Get sued’. And lawyers are expensive. So it looks like a case of looking for ways into pro bono assistance where possible, and building in costs where necessary in funding proposals. And, probably, just not doing some stuff that we might like to. Bah. Any further ideas (or offers of help, e.g. 2 above) would be most welcome. 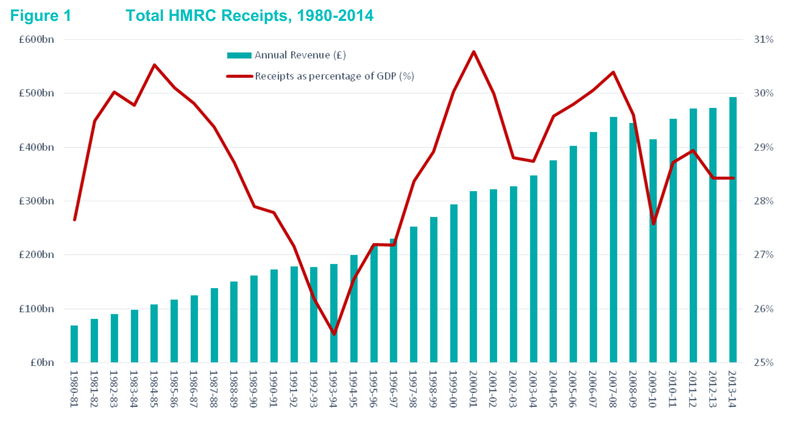 Is the UK “collecting more tax than ever before”? 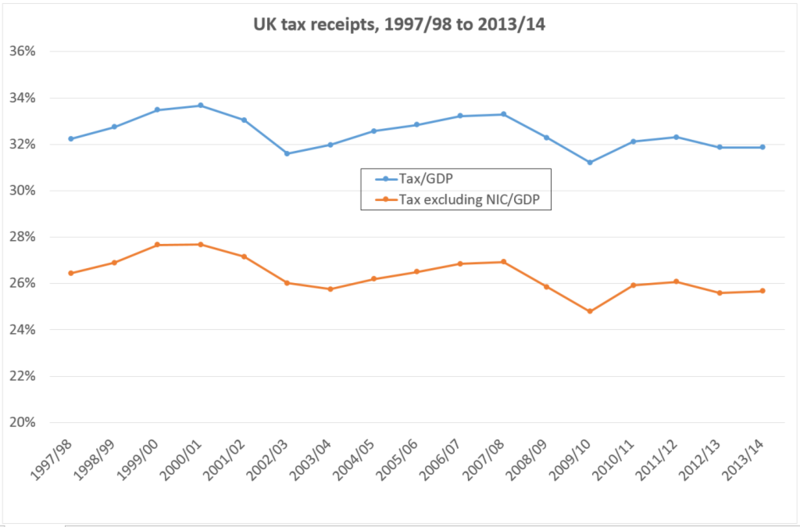 Update 20 Feb. 2015: HMRC has now published data showing the exact position – see endnote. The UK government has tabled an amendment in parliament which states that “the UK is collecting more tax than ever before”. I can’t square that with the government’s own data – can anyone help? That this House notes with concern that following the revelations of malpractice at HSBC bank, which were first given to the Government in May 2010, just one out of 1,100 people who have avoided or evaded tax have been prosecuted; calls upon Lord Green and the Prime Minister to make a full statement about Lord Green’s role at HSBC and his appointment as a minister; regrets the failure of the Government’s deal on tax disclosure with Switzerland, which has raised less than a third of the amount promised by ministers; welcomes the proposals of charities and campaigning organisations for an anti-tax dodging bill; and further calls on the Government to clamp down on tax avoidance by introducing a penalty regime for the General Anti-Abuse Rule, which is currently too weak to be effective, closing the Quoted Eurobonds exemption loophole, ensuring that hedge funds trading shares pay the same amount of tax as other investors, introducing deeming criteria to restrict false self-employment in the construction industry, and scrapping the shares for rights scheme, which the Office for Budget Responsibility has warned could cost £1 billion in avoidance. Line 1, leave out from ‘House’ to end and add ‘notes that while the release of information pertaining to malpractice between 2005 to 2007 by individual HSBC accountholders was public knowledge, at no point were Ministers made aware of individual cases due to taxpayer confidentiality or made aware of leaked information suggesting wrongdoing by HSBC itself; notes that this Government has specifically taken action to get back money lost in Swiss bank accounts; welcomes the over £85 billion secured in compliance yield as a result of that action, including £850 million from high net worth individuals; notes the previous administration’s record, where private equity managers could pay a lower tax rate than their cleaners, very wealthy homebuyers could avoid stamp duty and companies could shift their profits to tax havens; further recognises that this Government has closed tax loopholes left open by the previous administration in every year of this Parliament, introduced the UK’s first General Anti-Abuse Rule, removed the cash-flow advantage of holding onto the money whilst disputing tax due with HMRC, and allowed HMRC to monitor, fine and publicly name promoters of tax avoidance schemes; notes this Government’s leading international role in tackling base erosion and profit shifting; welcomes the commitment to implement the G20-OECD agreed model for country-by-country reporting and rules for neutralising hybrid mismatch arrangements; notes the role of the diverted profits tax in countering aggressive tax planning by large multinationals; supports the Government’s adoption of the early adopters initiative; and recognises that as a result the UK is collecting more tax than ever before.’. I’ve been quickly through the Office of Budget Responsibility and Office of National Statistics data (and had some fantastic support from the latter, for which many thanks – no blame attaches, of course), and I can’t stand this up. Here’s a graph, of total (central government) tax receipts, with and without National Insurance Contributions (which OBR do include in tax). This leaves out local government tax – business rates and council tax. Surely such a basic error wouldn’t be made in a parliamentary amendment, so there must be some other explanation. The only thing I can think of is that the government are referring to tax receipts in current, cash terms – but that would make no sense at all for a comparison over time, in fact it would be seriously misleading. So maybe there’s something I’m missing. Any answers below the line, please. Much of the #SwissLeaks data has been in the hands of tax authorities for 5 years. Many of the questions raised relate to individuals and to particular regulators and governments – but there’s also a broader question that goes to the type of solutions that will address the broader loss of trust in tax authorities’ effectiveness and independence. Clear policy changes are needed to recover trust and accountability. 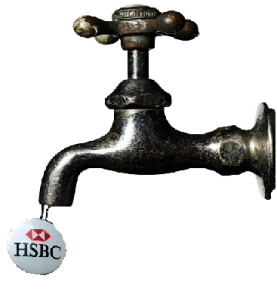 Last night the International Consortium of Investigative Journalists (ICIJ), and a host of international media organisations from Le Monde and The Indian Express to the BBC and CBS, broke publicly a leak of documents from HSBC’s Swiss bank, dating to 2005-2007. TJN provides a little historical context here, while Richard Murphy poses some highly pertinent questions. 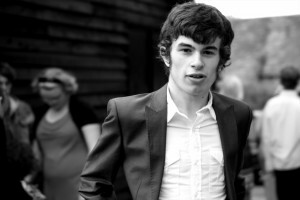 Oh, and TJN’s Jack Blum gave a cracking interview to 60 Minutes. If there’s a broader lesson here – and there is! – it’s that providing data privately to tax authorities is insufficient. The leaked data provided privately to (mainly European) governments in or around 2010 simply failed, in different ways, to deliver accountable and effective taxation. Exhibit I: UK. Since receiving details of more than 1,000 cases in 2010, the UK has undertaken 1 (one) prosecution. The coalition government that came to power in 2010 also negotiated a very bad agreement with Switzerland that TJN had shown beforehand would not only protect tax evaders from transparency and prosecution but would also fail to bring in anything like the claimed sum of revenue. In addition, the government appointed as a Lord and trade minister Stephen Green, who had been the chief executive and then chairman of HSBC during the entire period. Exhibit II: Greece. Somewhat further down the road of accountability is Greece, where the then minister of finance is now facing charges of “attempted breach of trust at the expense of the state and improperly interfering with a document”, for alleged actions relating to the loss of the list received from France, and the possible removal of relatives’ names. Exhibit III: India. As of last month, The Indian Express reports that 15 people were facing prosecution out of more than 600 names provided by France in 2011. 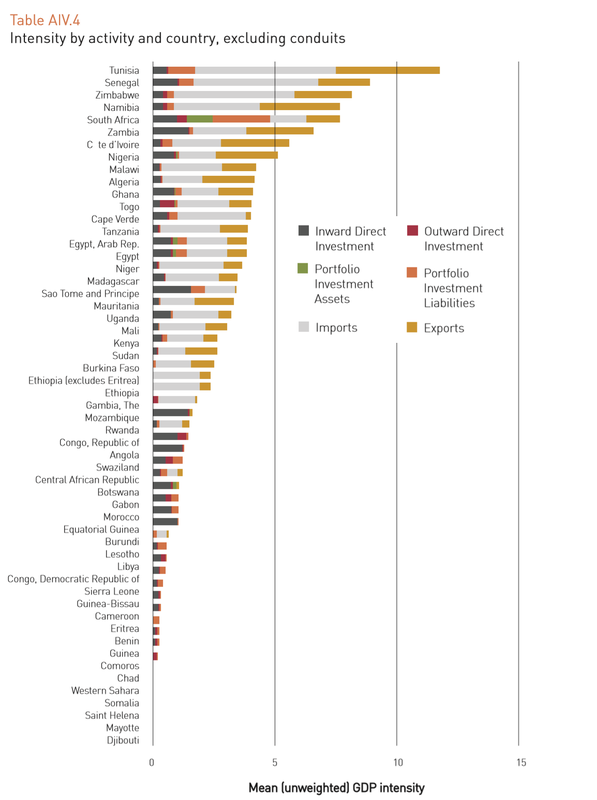 Today, they have published data from #SwissLeaks relating to 1195 names. Exhibit IV: USA. Here the questions relate, once more, to what action exactly followed from the 2010 receipt of leaked data from France – and whether HSBC should have been allowed to maintain its banking licence. As The Guardian notes, no reference to the case features in the HSBC settlement of nearly $2bn relating to sanctions-busting activities. Exhibits V and VI: Denmark and Norway. With thanks to @FairSkat and @SigridKJacobsen respectively, both of these countries with a relatively strong reputation for fair taxation did the ‘inexplicable’ and chose not to request the data from France. In the wake of the #SwissLeaks story, both now seem likely to. Without confidence in fair and accountable taxation, governments risk the erosion not only of wider tax compliance, but of state-citizen relations and so of effective democracy (see e.g. recent behavioural and cross-country studies on the important role of tax). That doesn’t necessarily mean that individual taxpayer data should be in the public domain. While some countries go to this length, many consider it a serious violation of privacy. What sort of transparency is needed for accountable taxation? How can governments (re)build trust that the rich and powerful – not to mention the criminal – will not simply go uncounted behind closed doors? A parallel case is that of the watering down of proposals for country-by-country reporting by multinational companies. Publication is necessary so that companies are held to account for abuses, but also so that tax authorities (and governments) are held to account for fair and effective taxation. Private provision of this data to tax authorities may allow them to tax companies more effectively, but does nothing to demonstrate to citizens if such an opportunity is actually taken. Much of the #Luxleaks data was available to tax authorities, in theory or in practice, but only publication has led to a policy response. As I twoth last night, the lesson of #SwissLeaks is that accountability demands public transparency. We’ve already blogged at TJN about the Mbeki panel’s historic report on illicit financial flows (IFF) out of Africa. Here I want to pull out a particular aspect, a new approach to IFF which is pioneered in the report. All IFF approaches to date have focused on estimating the actual scale of flows, in currency terms, on the basis of anomalies in data on cross-borders flows and/or stocks. This raises (at least) two inevitable problems. First, the data are imperfect – and hence anomaly-based estimation may confuse bad data on ‘good’ behaviour with good data showing ‘bad’ behaviour. Second, the behaviour in question is, by definition, likely to be hidden – so it may be unrealistic at some higher level to expect public data to provide a good measure. The alternative, or complementary approach, is to pursue a risk-based analysis. Because of the behaviours involved, whether IFF are strictly legal or not, they contain some element of social unacceptability that means the actors involved will prefer to hide the process. For that reason, the risk of IFF will be higher – all else being equal – in transactions and relationships that are more financially opaque. That will mean, for example, that the chances of uncovering IFF will be higher in anonymous shell companies than in companies with complete transparency of accounts and beneficial owners. Not all anonymous shell companies will be used for IFF, but the risk is higher. Similarly, at a macroeconomic level (at which level much data tends to only be available, unfortunately), trading with a relatively financially secretive jurisdiction such as Switzerland will be characterised by a higher IFF risk than trading with a relatively financially transparent jurisdiction such as Denmark. At present, the most common measure of financial secrecy is the Financial Secrecy Index (FSI), published every two years by the Tax Justice Network, and now used widely—for example, as a component of the Basle Anti-Money Laundering Index and of CGD’s Commitment to Development Index, and as a risk assessment tool recommended in the OECD Bribery and Corruption Awareness Handbook for Tax Examiners and Tax Auditors. The secrecy score on which the FSI is based reflects 49 measures, grouped to form 15 indicators, which capture a range of aspects of financial secrecy from transparency of beneficial ownership and accounts, through international juridical cooperation. The secrecy score ranges in theory from zero (perfect financial transparency) to 100 per cent (perfect financial secrecy); in practice no jurisdiction has scored less than 30 per cent. Consider an illustration, involving one country’s exports – say Ghana. For each trading partner, we combine its share of Ghana’s exports with its secrecy score (which ranges from zero to 100). The results can be summed to give an overall level of secrecy for all of Ghana’s exports, and this score reflects Ghana’s vulnerability to IFFs in its exports (the flow-weighted average financial secrecy of all partners). If we multiply this vulnerability score by the ratio of Ghana’s exports to GDP, we obtain a measure of the country’s exposure to IFF risk, which can then be compared across other stocks or flows. This measure of intensity of exposure to IFF risk can then be compared (given data), across time, countries and stock or flow types (with some important caveats). 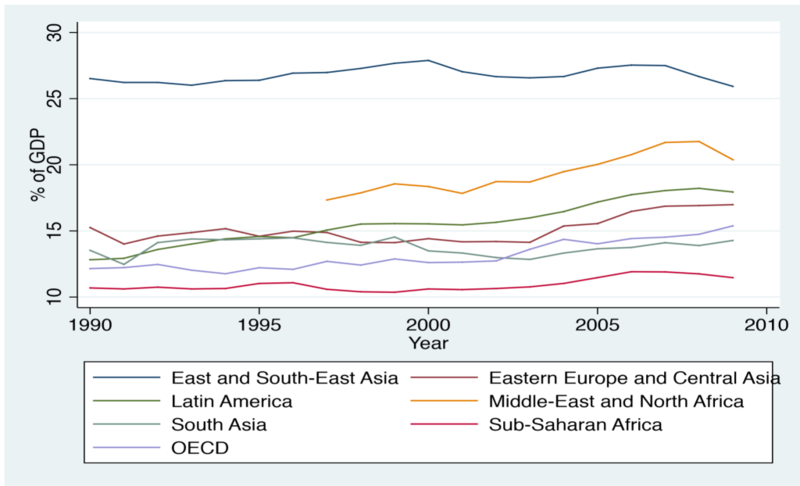 Table AIV.4 from the Mbeki panel report provides an indication of the overall intensity of exposure across African countries (excluding the major conduit jurisdictions). Further detail can be found in Annex IV of the Mbeki panel report, while Alice Lépissier and I are working on a full paper to follow. Comments on the approach are very welcome indeed.